Given the extraordinary quantity and quality of churches Rome already offers, did the city need another, and would you want to take the time to travel out to a workaday suburb to visit it? The Vatican was apparently sufficiently clear on the first question to fund the construction of an additional 50 churches to celebrate the "Jubilee" (Millennium) in 2000, and after a visit out to Tor Tre Teste I am just as clear on the second. "Light is the protagonist of our understanding and reading of space. Light is the means by which we are able to experience what we call sacred. 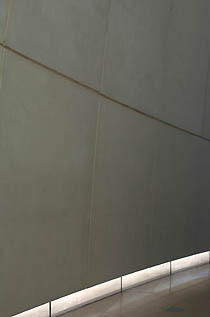 Light is at the origins of this building... 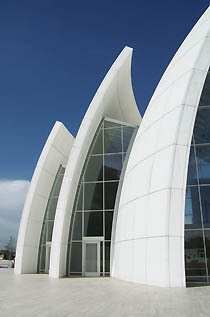 In the Jubilee Church, the three concrete shells define an enveloping atmosphere in which the light from the skylights above creates a luminous spatial experience, and the rays of sunlight serve as a mystical metaphor of the presence of God..."
"Transparency and light cascade down from the skylit roof, literally invading the interior of the church also penetrating from below through a narrow slot opened at floor level. 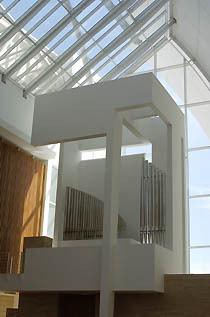 People in the atrium are enveloped with mystical light." "These are the contemporary churches that have impressed me most, and I would say that what they all share is the importance of light." 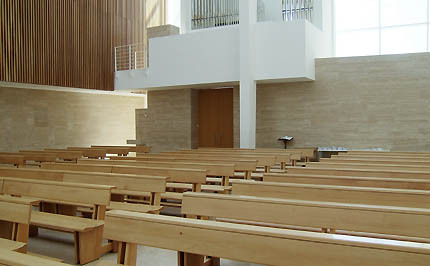 The color palette and materials in the Jubilee church are restrained and beautiful: traditional Roman travertine; more recently-Roman smooth, white concrete, invented for the Olympic Stadium in Rome in 1960 and created by Italcementi; and light wood panelling and pews. 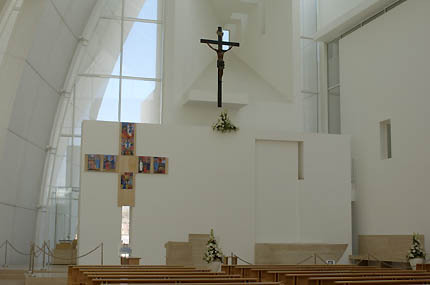 With the structure supported by the curved cantilever of the concrete-clad shells, reaching over towards the opposite "spine" wall, the west (altar) and east (organ) walls are light glazing, surrounding the bright, white set pieces for the cross and organ respectively. As the church guide describes it, "Taking part in a prayer, you feel like celebrating in the presence of God thanks to the roof of the nave, the eastern and the western facade entirely made in glass." 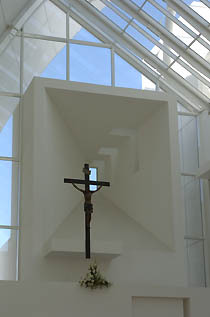 Despite all the glazing, the geometry is such that direct sun almost never comes into the church. 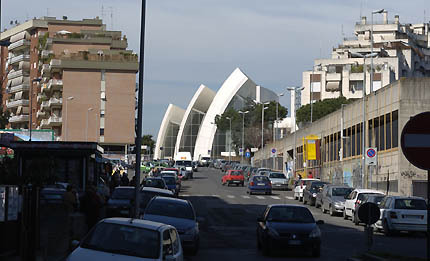 The Jubilee Church is in Tor Tre Teste, a suburb about six miles east of the center of Rome (just inside the ring road). By car, take the Via Casilina, either west from the ring road (exit 18) or east from Rome, and turn north on Via Tor Tre Teste. 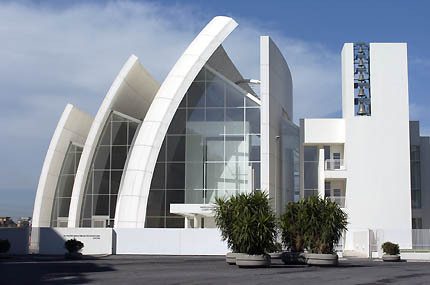 Once in the community, turn left onto Via F. Tovaglieri and the church will be visible. By public transport, take the bus 105 from Rome's Termini station, towards Grotte Celoni. Get off at the bus stop called TOBAGI. Cross over to the north side of Via Casilina, cross the railroad and walk about 100 meters into the street Via Walter Tobagi where the bus stopis placed (because of a building site you may not see the bus stop from Via Casilina). Take bus 556 heading Gardenie and get off at the bus stopTovaglieri, just before the church. When you go back, use the same busstop. The total journey takes 45-60 minutes or a little more. It will pay you to buy a 24hour ticket at the Termini bus stop. This will cover the whole area for bus and metro. For more information, including the church's opening hours ("orario apertura della chiesa" in Italian) visit the church's web site at www.diopadremisericordioso.it. 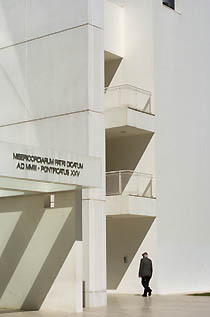 www.richardmeier.com has Richard Meier's own description and photographs. 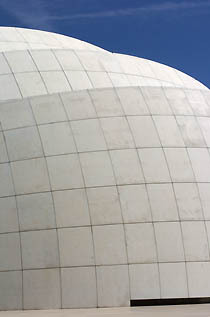 Italcementi's description of their role in constructing the concrete sails, with structural information and interesting construction photographs, can be seen in an 8-page pdf document.